The premium wines of Appellation St. Helena (ASH) shone brightly once again at bASH 2017, the local wine and food pairing competition where attendees’ votes determined the ultimate winners. 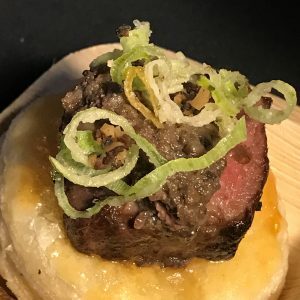 During the event, over thirty premium wineries joined forces with local professional culinary talent as well as 31 teams of “Rising Star” students from the Culinary Institute of America. Cabernet Sauvignon, Merlot, Malbec, Petit Verdot and Zinfandel wines made from grapes grown in the St. Helena appellation were paired up with dishes created using Black Trumpet Mushrooms, Celery Root, Eggplant, Escarole, Chicharrones, Duck Breast, Chicken Liver, Beef Brisket, Pork Belly and Roasted Lamb (and more) for an evening of savory delights. At the end of the night, the final winners were couplings of Cabernet Sauvignon and Beef. The audience favorite for the wine and food combination was the Pellet Estate 2014 Cabernet Sauvignon paired with a Deconstructed Wellington (Beef Tenderloin, Foie Gras Mousse, Prosciutto di Parma, Duxelles, Crispy Leeks, Perigord Black Truffle on Puff Pastry with a Cabernet Reduction) from Jessica Haryanto (Indonesia) and Chase Evans (Lake Sherwood, CA). 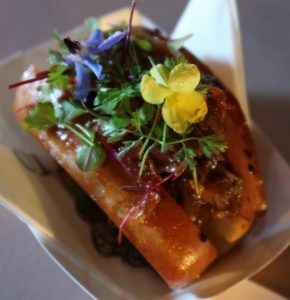 On the professional Chef competition side, the winner was Executive Chef Joshua Schwartz from Del Dotto Vineyards with his Nana’s Brisket Sandwich (served with Crispy Shallots and Thyme Aioli). 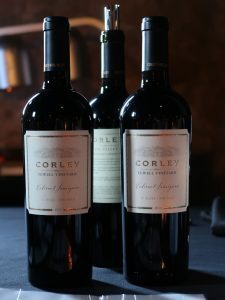 The winery actually offered two different wines to enjoy this with: their 2014 Vineyard 887 Family Reserve Cabernet Sauvignon and 2014 St. Helena Mountain American Oak Carved & Grooved Cabernet Sauvignon. Our favorite part of the night? The increased presence, and wonderful pairings with, white wines. 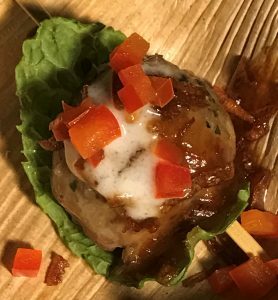 The 2017 bASH had, for us, the highest number of white wines we really enjoyed and outstanding dishes paired with them compared to all prior bASH events. In fact, one of our personal top three pairings of the night was with a white wine and it came in 3rd place. That was the Salvestrin Winery 2016 Sauvignon Blanc and Crab Tater Tot with Lemon Thyme Beurre Blanc from Sienna Best (Palmer, AK) and Leila Welch (Elko, NV). Keep reading and we’ll tell you more about our favorite wines and dishes that evening. To deepen your own understanding of the St. Helena Appellation’s offerings, please check out the wineries and wines below. We’ve also got the names of some CIA Student Chefs whose careers you may want to start following. 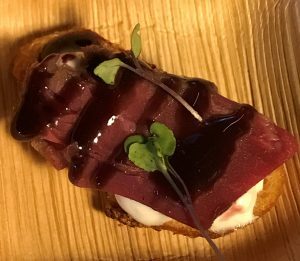 At bASH 2017, it was clear once again that a lot of thought and effort had gone into the chefs’ creations (because really, who was expecting Eggplant Mousse in a pairing?). There were 39 wine and food pairings that night and we’ve listed below our most favorite small plate combinations prepared by other CIA Student Chefs (in addition to the two combinations already described above). 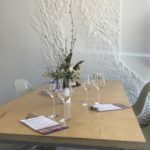 Each time, we were impressed three ways: the wine itself, the food alone, and how well the elements of the dish complimented the flavor nuances of the wine. We especially enjoyed two additional pairings during bASH 2017 and they both happened to come in 2nd place! 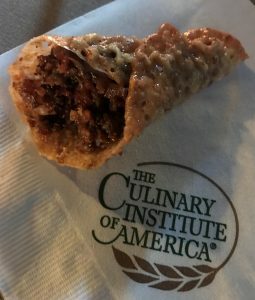 First, there was only one sweet dish prepared that night and CIA Student Chefs Alexis Strasser (Williamsburg, VA) and Kaeli Johnson (Misawa, Japan) did an awesome job crafting a Chocolate Bacon Drumstick served in an Almond Lace Cookie Cone. Their pairing of this treat with the Revana Family Vineyard 2014 Estate Cabernet Sauvignon earned them 2nd place in the Student Chef competition. 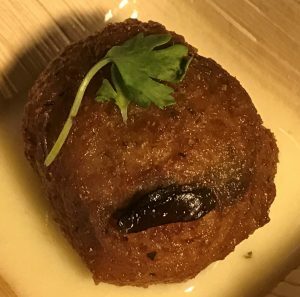 Then, our personal favorite for food and wine pairing involving a professional Chef this year was the Saint Helena Winery 2014 Estate Cabernet Sauvignon alongside Acacia House Dolmas. The Dolmas were made by Executive Chef Thanawat Bates with Black Trumpet Mushrooms, Sweet Peas, Garlic and Mint, and then topped with Orange Labnah and Caviar. This combination actually came in 2nd place for the professional Chef competition that night. FYI, Las Alcobas became Napa Valley’s first luxury boutique hotel, restaurant & spa to open in seven years earlier this month. The onsite restaurant Acacia House is headed up by Chef Chris Cosentino and is scheduled to open next month on May 8. 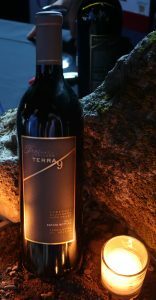 If you are looking for excellent current wines from the St. Helena Appellation, we found many at bASH 2017 and highly recommend you seek these out in stores, at a restaurant, or from the wineries themselves. Please follow the links below to the wineries’ websites to learn more about wine availability and whether or not the winery has a tasting room open to the public. Appellation St. Helena is a non-profit organization dedicated to encouraging and promoting the highest quality standards in grape growing and wine making in the St. Helena American Viticultural Area (AVA), and to gain recognition for this quality through education of the membership and the public. If you are interested in learning more about the organization and its activities, or to be one of the first to hear details about bASH 2018, we encourage you to go here to get onto ASH’s mailing list. Attentive and enthusiastic review as always, TwoGuys! So glad you were there! Thank you!